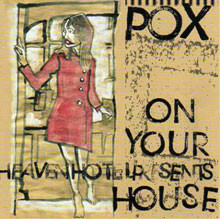 Pox was formed in Antwerp in 2005 when Mark Meyers and Koen van de Camp decided they wanted to soup up the sound of their previous cooperation Plank. Jurgen Leclerq, an old acquaintance and guitarist in Wall of Sweat, was asked to join on bass. After a couple of rehearsals with drummer Bekin Ratta, Rudy Trouvé joined the band. With this line-up a first demo was recorded. A decision is made to simplify the drum sound en Craig Ward takes to the drum seat. A single track is recorded for the Jezus Factory compilation album. The recording of a full cd is scheduled but the nomadic nature of Craig (who moves to another country) leaves Pox in need of a new drummer. Percussionist Dirk D’Hooge (Kiss My Jazz/Lionell Horrowitz) tries out and in no time masters the minimalistic drumming Craig had introduced. Craig returns to Antwerp briefly during the recording of Down on your House, adding a couple of overdubs and mainly joining Rudy on the producing/mixing side of things.